Despite its cute appearance and its petite size this vehicle is a powerhouse to be experienced! The Skoda Octavia has features people love like fuel efficiency, advanced safety features, great power output, and a design that is both comfortable and practical. 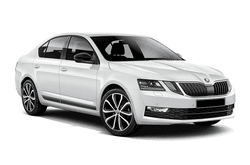 When you are in need of a quality and reliable rental car, the Skoda Octavia is here to deliver and is sure to impress. Car rentals are a big deal but you are making a great choice with this newest offering from Skoda and you are sure to be the talk of the town thank to your great taste in style and luxury. Get yours today and experience it for yourself!